Pauline Chase and Maurice Temple. 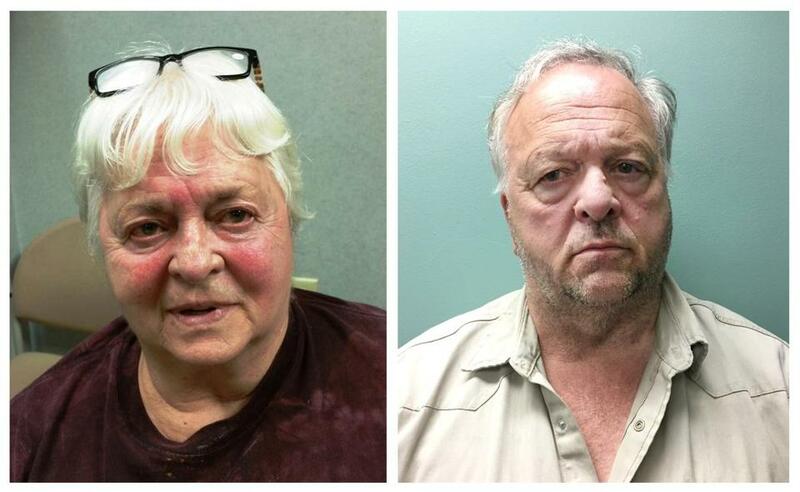 An 83-year-old Plainfield, N.H., woman and her 63-year-old son allegedly paid another man $5,000 to kill the son’s former wife in a bizarre murder-for-hire plot, authorities said Friday. Now, Pauline Chase and her son, Maurice Temple, who live together in the town of roughly 2,400 residents, need $1 million apiece to make bail on conspiracy and attempted murder charges stemming from the alleged plot to kill Jean Temple, Maurice’s former wife. Earlier in the week, Maurice Temple told police he would only leave his home “in a body bag” when they came to arrest him on a separate matter, according to legal filings. Both Chase and her son were arraigned Friday in the 5th Circuit District Division court in Claremont. Judge John J. Yazinski ordered each of them held on the steep bail amount, records show. They did not enter pleas. Chase, who like her son listened to the proceedings via video conference, said “she’s the one that needs to be arrested” when Jean Temple’s name was mentioned in court, the New Hampshire Union Leader reported. Public defenders for the mother and son could not immediately be reached for comment. A call to a number listed for Jean Temple was not immediately returned. According to court papers, Chase and her son repeatedly discussed a plot to kill Jean Temple with a man named Mark Horne, 63, between July 20 and July 27. The Plainfield town website lists Horne as vice president of the local volunteer Fire Department, and Jean Temple as treasurer. Chase allegedly asked Horne “how much it would cost to get rid of Jean Temple,” a legal filing said. She also, “alone or with” her son, discussed the possibility of Horne’s committing the murder and gave him $5,000, “with Maurice Temple present and/or participating in the conversation, as a down payment” for the killing. The murder never happened, and Horne has not been charged. Marc Hathaway, county attorney for Sullivan County, said Friday that Horne is not a suspect and is cooperating with investigators, the Union Leader reported. Hathaway did not respond to inquiries seeking further comment. Mother and son were arrested Thursday, and it was the second arrest of the week for Maurice Temple, court records show. On Sunday evening, Plainfield and State Police came to the house to take him into custody on a contempt warrant for violating court orders. Legal filings show that Maurice owed his former wife money as part of divorce proceedings, WMUR-TV reported. When police arrived Sunday at Temple’s home on Old County Road, they asked his mother where her son was, and she said, “I fed him breakfast this morning and sent him on his way to West Hartford to do some concrete work and he hasn’t gotten home yet,” an affidavit said. However, officers later located Temple in the basement, and he initially refused to go with them to be booked. Temple allegedly began to pull away from local and State Police who tried to handcuff him, forcing authorities to bring him “slowly” to the floor, the filing said. That maneuver enraged his elderly mother. Police eventually handcuffed Temple, and he lashed out at Judge Yazinski at the Plainfield station, when a bail commissioner asked him to sign a form, according to the filing. “Temple said, ‘Yeah right! That Jack Yazinski is crooked!’ ” the affidavit said. He was later taken to the Sullivan County House of Corrections and was charged with resisting arrest, in addition to the court order violation. Both defendants are due back in court Aug. 7. If either of them posts bail, they are barred from contacting each other, Horne, or Jean Temple, among other conditions, according to court records. John R. Ellement of the Globe staff and Globe correspondent Ben Thompson contributed to this report. Travis Andersen can be reached at travis.andersen@globe.com.